COSTA MESA, Calif., March 25, 2019 /PRNewswire/ -- Record levels of credit card debt, rising interest rates and a proliferation of alternative lenders are making personal loans the fastest-growing category of consumer debt products. According to the J.D. 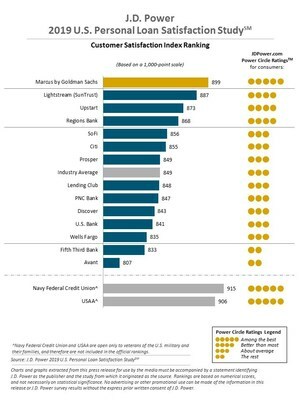 Power 2019 Personal Loan Satisfaction Study,SM released today, many of these alternative lenders are upping the ante on customer satisfaction by outperforming lenders that provide more traditional loan types, such as home equity lines of credit (HELOC), through superior digital experiences and lightning-fast approval times. "Given that half of all personal loans are used for debt consolidation or to pay off a credit card, it's crucial that lenders get the customer interaction formula right with easy-to-navigate digital applications and rapid approval processes," said John Cabell, Wealth & Lending Intelligence Practice Lead at J.D. Power. "From a digital perspective, traditional banks need to work hard to meet evolving customer expectations. Non-traditional alternative lenders have their own communications gaps to overcome when it comes to customer perception of pricing and being profit driven. As this business matures and new players continue to enter the market, understanding competitor tactics and clear articulation of the value proposition to customers will become increasingly critical areas of focus." See the online press release at http://www.jdpower.com/pr-id/2019048.